November 11, 2008 is Veterans Day in the United States. This year marks the 90th anniversary of World War One, which was fought from 1914 to 1918. VOA's Deborah Block recently met perhaps the last living U.S. soldier who took part in what was known as the "Great War." ANOTHER VETERANS DAY HAS ROLLED AROUND AND I SALUTE YOU ALL! THANKS FOR YOUR SERVICE AND DEDICATION. Nov 11, 1903 was my grandmother’s (Non) birthday. I asked her one time what it felt to have WWI end on her 15th birthday. She told me they were too busy working to care. My grandmother was a straightforward person and just answered the question honestly. I will tell you she took her responsibilities as a voting citizen very seriously. Three years later when she married my grandfather, at the age of eighteen, she lost her citizenship despite having been born in the US because my grandfather was a LEGAL resident alien. They went to naturalization classes together and she became a citizen again three years later. She was fire-breathing liberal/Democrat and never missed an opportunity to vote. She lived to the age of 82. The story was different when WWII ended however. They had a son (my uncle Ralph) fighting with Patton in Europe. There was a lot of relief that he had survived and came home in one piece. Three years later when she married my grandfather, at the age of eighteen, she lost her citizenship despite having been born in the US because my grandfather was a LEGAL resident alien. I had no idea such a thing could happen, APL... I thought once a US citizen, always a US citizen...geez...and how could it happen if your grandfather was a legal resident alien? :shock: I had no idea such a thing could happen, APL... I thought once a US citizen, always a US citizen...geez...and how could it happen if your grandfather was a legal resident alien? The law was designed to discourage immigration but only of men. If it had been my grandfather who was the citizen, he would not have lost his citizenship and my grandmother would have been “fast-tracked” to citizenship. Therefore, the law was both sexist and anti-immigration. Bringing more breeding mothers into the country was encouraged. This was post WWI until the early 30’s. ANOTHER SALUTE TO THE VETERANS AND BEST WISHES TO ALL OF THE RETURNING VETS FROM THE WARS IN IRAQ AND AFGHANISTAN. 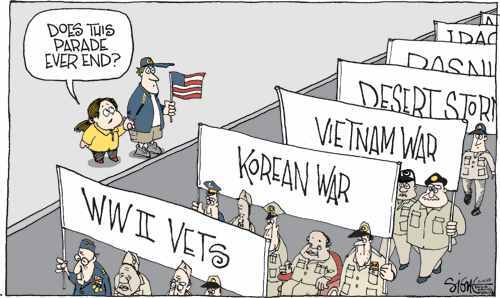 MAYBE THIS TIME NEXT YEAR, THEY WILL ALL BE HOME WITH NO WARS LOOMING ON THE HORIZON. WE LOVE YOU!